One of our RISAC members was recently arrested for standing on a short wall along the shore in front of Taylor Swift’s home in Westerly. This wall had been free standing for years, and when Ms. Taylor was given permission to rebuild her stone revetment, the wall disappeared into the reconstruction. High tide comes right up to the wall, so there is no way of passing along the shore except along the wall. I went down to check it out with the fellow who had been arrested, and these short videos give you an idea of what shore rights for RI citizens means to some property owners. Our RI constitution says the police are duty bound to protect our right to pass along the shore…here they are doing the exact opposite. Money talks louder than the law. Piling rocks & boulders onto a beach in order to cover the high tide line is becoming a common practice in front of many RI coastal McMansions. In Warwick on Beechwood St. there’s a property owner who has effectively cut a 1/4 mile stretch of beach in half by using this tactic. Effectively, these obstructions are preventing anyone from walking the beach even at the lowest ebb tide. There ought to be a law – oh wait there is. But who enforces it? RISAC perspective: Those rock piles, in many cases, were once retaining walls hundreds of feet from the water. With sea level rise, in the last few decades, the water’s edge has moved hundreds of feet inland. The retaining walls are now sea walls, and it brings up a fundamental problem. Can one citizen’s landscaping deprive a million Rhode Islanders of their right to pass along the water’s edge. Emphatically the answer is NO! Certainly people can improve their property, people can protect their property…as long as their efforts include measures keeping it possible for all of us to exercise our constitutional rights. Our government has lost its way…get involved, send out those e-mails, make RI the little state that DID! Read the three piece article in the “News” category of posts to get up to date on the Ibbison controversy that has introduced a discussion of tides where it is not warranted. Most shoreline properties in Potowomut have “seawalls”. However, this one individual has taken this to an extreme by piling the boulders onto the beach as well – all the way to the water’s edge. RISAC PERSPECTIVE: Shore front properties can certainly be improved, altered, etc. with the correct permits. 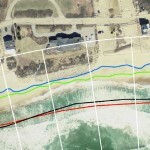 If the alterations somehow make it difficult or impossible to pass along the coast, it is the responsibility of the property to provide an effective alternative path for our passing. 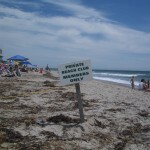 Other states with open beach type laws have rules and regulations on how to do this. I don’t care Who she is or how much money she has run the b____h out of town and anyone supporting her! RISAC perspective: Anger isn’t the answer unless it leads to constructive action. Send out those e-mails to the addresses in the recent update letter! Get our government to do the right thing in the Beach SAMP process now under way. Turn this energy into action! Time for another 56 or 38 title wave I think,time to clean out the trash! RISAC perspective: Glad you feel energized enough to comment, though your message is a little too strident to be endorsed by the coalition. Though the next hurricane will certainly rearrange the rocks that make up the revetment in front of TS’s home, that won’t change the constitutional situation. Whatever the scene looks like post hurricane, we retain the right to “including but not limited to fishing from the shore, the gathering of seaweed, leaving the shore to swim in the sea and passage along the shore.” The “shore” is the dry land bordering the sea, not the area between the tide lines. I say, if that is the case, why was he arrested… They have gone over and over this…. Get over it , life is it to short !!! She had the permits which others try to say she did not… Stop being so jealous about a 25 yr old mult millionaire. RISAC perspective: He was arrested in a location on the shore that our constitution gives him the right to be on. In the past, the public trust doctrine from which our shore rights spring, allowed many activities ABOVE THE HIGH TIDE LINE. That is the constitutional point…the citizens can use the edge of the land bordering the sea. Ms. Swifts construction is not a problem; she should be able to work on her property. But…she could have built in a walkway to allow the public to walk past her property. 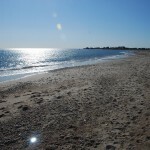 If she wants to alter the natural shore to protect her investment, the constitution dictates that she has to design and include in her construction a way for the citizens of RI to “pass along the shore” in front of her land. It is only the infamous Ibbison court ruling that has created this misconception that shore rights and privileges are located only below the high tide line. Have the police arrested for not doing their job. RISAC perspective: The individual policemen making these arrests aren’t to blame. The problem lies with our state agencies which have been mistakenly using the isolated Ibbison case to diminish our inherited rights and privileges of the shore. I am sure the officers involved, if they came to understand how this has been mishandled in the last few years, would want their kids and grandkids to inherit their full rights of RI citizenship. It would appear that the legislature does not wish to touch the beach access issue so the only way to get some movement is through the judicial system. The individual who was arrested needs to challenge the arrest and with the proper backing, take the case up through the system. With the right case and timing, Ibbison can be re-written. RISAC PERSPECTIVE: Rusty, if you are a lawyer, thanks for volunteering! Believe it or not, the day of the video I was with a surfing professor who had been arrested there several weeks before. He had some civil penalty and that was that. But some one else may be in that situation soon, as more situations which restrict passage are identified. 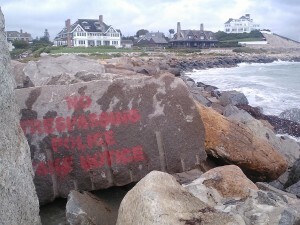 Your picture of the boulder with the NoTrespassing paint on it is far away from Taylor Swift’s property, is actually on light house land (and is high above high tide line) and so is completely misleading. I do not think it is in your best interest to include this photo in your campaign- it causes me to question your integrity in the rest of your article. As a young kid surfing the Watch Hill Lighthouse, I was almost always yelled at by the lighthouse keepers to get off the rocks when trying to find the fastest way to the surf. I know where this boulder is and it ain’t anywhere near TS’s property. I’m all for water access but you’re obviously going to (false) extremes to get yourself attention. RISAC perspective: The boulder in the picture is at the public point of access to the shore to the west of Ms. Swift’s property. It is at the point where the public lighthouse land touches the private property of the house behind it on the hill, the neighbor of Ms. Swift’s. The constitution says nothing about tides…we have our right to “pass along the shore” (the land bordering a usually large body of water) at ANY TIDE!! We have the right to step onto these rocks, from this public access point to the land bordering the sea, and walk (among other things) to the Weekapaug Breachway without any interference. It is the misguided and misleading Ibbison court case that has caused this theft of our rights, and apparently given you an incomplete appreciation of the rights you have inherited. Anyone know how the Misquamicut Club managed to take possession of Fort Road leading out to Nappatree? I always thought it was the remnant of the old public road and now it is paved and gated. RISAC PERSPECTIVE: Checking the land records at town hall would solve it…if it is on the maps of record then it should be public access. My questions are simple. Did this member go to court yet? If so did the charges stick? In any case where can we read the finding? If it is desired that some of us write our state reps about upcoming legislation is there a basic form letter available to go by? RISAC perspective: The truth is that the fellow who was arrested was dissuaded by court personnel from pursuing the issue. He wanted to get involved and fight it out in the open, but court staff made a forceful point that he was a young man with a family and a career to think about, that a court record would haunt him for life, etc. But that route, getting arrested and forcing a court fight to get the right thing done is certainly NOT OFF THE TABLE. As far as the court decision, just Google Ibbison and you can take your pick of the references offered. Ok, so there were no findings as the charges were dropped. Wouldn’t this case hinge on whether or not this member was traveling seaward or landward of the mean high tide line? The accused asked for guidance as to where the mean high tide line was. Seems like a slam dunk for acquittal. What about guidance on a letter to one’s state rep? John- It was I who asked the guards where the tide line was in an effort to challenge their knowledge of the Metonic tide location, which is addressed further in this reply. As the video shows…they were not focused on any type of tide line! Two things to address here. One is that any mention of the tide is inappropriate. That is the error of the Ibbison case legacy. The constitution does not mention tides at all, and in spite of the fact that there is a legal definition of “shore” that only includes the intertidal zone, we the people voted to accept “shore” in our constitution with only the generally available definition of “the land bordering a large body of water.” So our rights SHOULD be interpreted as being ABOVE the high tide line on that strip of land.